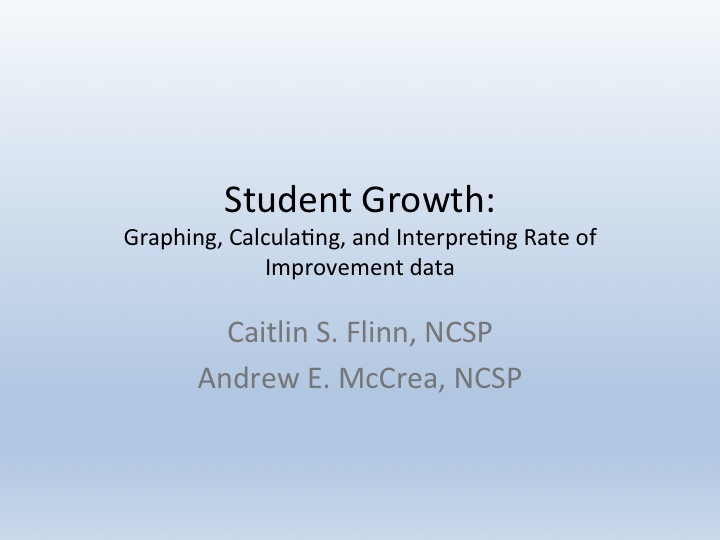 Gearing up to present with Andy McCrea tomorrow as part of PaTTAN’s RtI Implementer’s Forum tomorrow. As Andy and I were updating the PowerPoint this past week, we realized we’ve been speaking on this topic for 5 years now! It’s been interesting to see the evolution of awareness in our participants over time. Many more participants have access to curriculum-based measurement (CBM) data than when we first started. 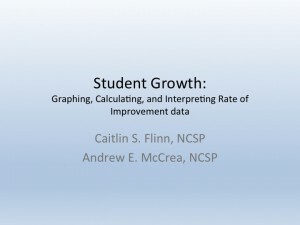 Even more have figured out how to graph data and generate trend lines in Microsoft Excel, some without realizing they are essentially computing linear regression statistics! We’ve presented for a range of audiences that started out as mainly school psychologists but has expanded to teams who are implementing components of RtI in their schools. Tomorrow’s workshop is formatted for just that – teams! Should be another great interactive workshop! Caitlin Flinn Bennyhoff, D.Ed., NCSP, is currently employed as a Nationally Certified School Psychologist in Pennsylvania. She completed her doctoral degree in school psychology at Indiana University of Pennsylvania. Her main interests include response-to-intervention, systems-level change, measuring student growth, and data analysis teams.